I know I've gone post crazy. I will stop soon, really. 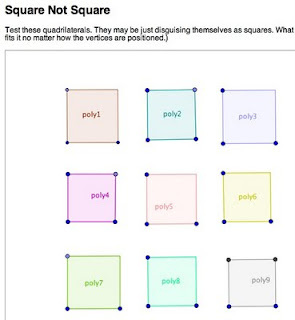 to check the 'real' type, as all 9 look like squares. by the angles rather than by edges or diagonals. 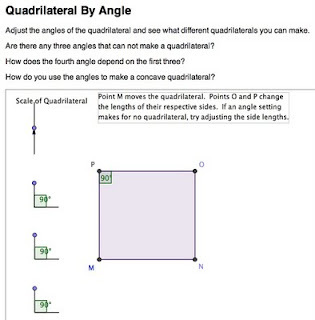 Links lead to webpages with the java sketches, as geogebra has a great export to webpage feature. They are java, so some browsers don't handle them as well as Firefox. If you prefer the actual geogebra sketches, it's SquareNotSquare.ggb and QuadByAngle.ggb. Most of the sketches I've seen so far have been for HS or university, so if you're interested in K-8 uses, please let me know! EDIT: Followup - the students were mostly positive, and some extremely positive. Definitely a better reaction than to the old computer labs with sketchpad. There was more interest in the program because it is so accessible; many more of them saw themselves as potential users of this time. It also connected with people's desire for visual representation. Makes me wonder, have I been underusing manipulatives this semester? Math Teachers at Play 15? !